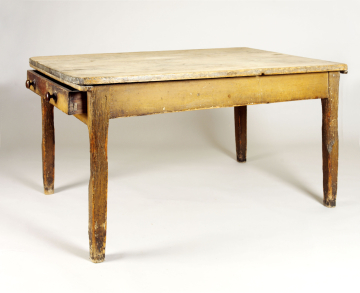 Kitchen table, XF352, English, unknown maker, early nineteenth century, deal, partly grained. ©Sir John Soane's Museum, London. Photograph: Hugh Kelly. With four square slightly tapering legs and a single drawer with two turned wooden knobs, probably later. This piece is much decayed through constant use in the kitchen. The sides are grained in imitation of oak.